Our romance hamper has all the ingredients for a dreamy romantic celebration or special anniversary. 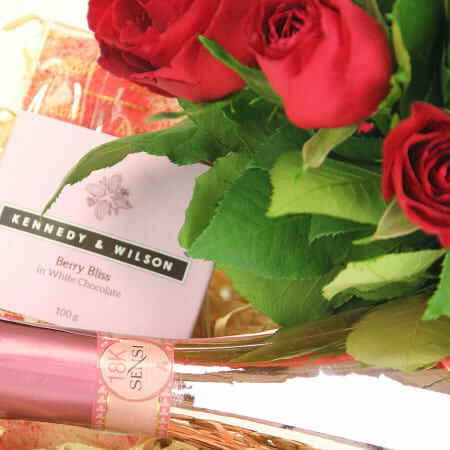 Presented in a reusable seagrass basket, it features a posy of fresh red roses with a bottle of Sensi Pinot Noir and a 100g bar of delicious Kennedy & Wilson Berry Bliss white chocolate. Made in the Yarra Valley, this chocolate is created using premium ingredients and goes beautifully with your bottle of bubbly. To complete our romantic trio of gifts are beautiful red roses (15cm length stem), arranged in a posy with seassonal greenery ready to pop into a vase on arrival to their destination. Important: Gifts which include alcohol cannot be delivered to or accepted by a minor. The gift CANNOT be left at the premises without being accepted by an adult. Gifts must be delivered between the hours of 7am and 7pm. PS. 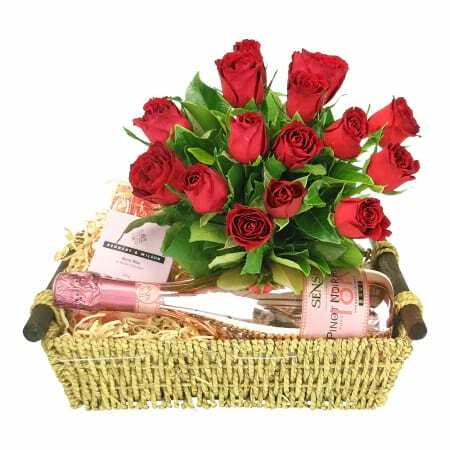 This romance hamper is delivered Sydney-wide and comes wrapped in a clear cellophane.